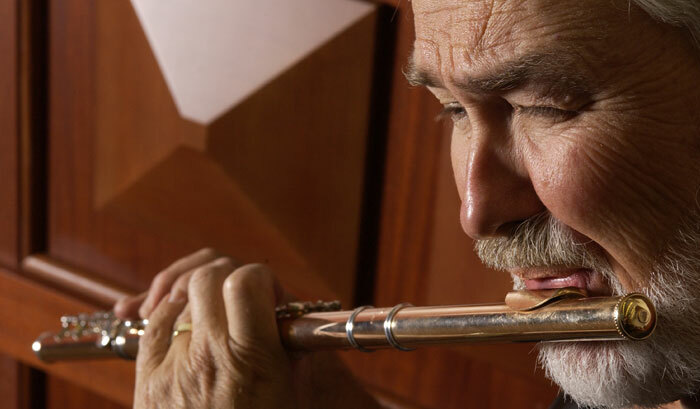 Jim Walker is one of the world's most respected flutists. Besides boasting gorgeous tone and impeccable technique, Walker has managed to excel in both the classical and jazz fields. The classical side: Walker has held the principal flute chair in major orchestras, worked with such great conductors such as Leonard Bernstein, Zubin Mehta, and Carlo Maria Giulini, and been hailed for his exquisite chamber music performances. The jazz side: Walker has also fronted the open-ended jazz-fusion group Free Flight since 1981, and he has contributed to countless film and TV soundtracks. He's a full-time lecturer at the University of Southern California and has held master classes and clinics on four continents. 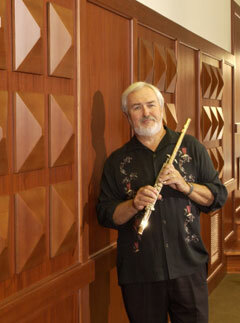 Walker's classes inevitably encompass improvisation and the many ethnic flutes that Jim also plays. We recently quizzed Walker about his wide-ranging career. I love playing with a strong rhythm section pulse and the harmonic interest of a piano. Why did you choose such an eclectic path instead of just hunkering down with an orchestra gig? I've always been a jack-of-all-trades, and not just in music. I love carpentry. I spent my summers growing up working on a farm. I went to a small school, so I played on the sports teams as well as being in the band. The idea of being diversified was always there, probably because my father was a band director/mathematician/ carpenter in Greenville, Kentucky, where I grew up. He was a clarinetist who also played on the church softball team. So I grew up seeing a man who was comfortable working in different areas. When did you decide to focus on flute? Not until after college. It was the height of the Vietnam War, and I managed to get into the West Point band-a guaranteed three-year assignment stationed just one hour from New York City. All the young guys in the band who were trying to avoid fighting overseas were incredible players. I didn't feel like I was in their league, though apparently I was good enough to be at the bottom of their league. I focused on practicing flute during those years and was lucky enough to land a job with the Pittsburgh Symphony shortly before I got out of the army. Later, I came to California when I was hired as co-principal chair for the LA Philharmonic. Were you listening to jazz during those years? In high school I listened to a lot of Miles Davis, John Coltrane, and Cannonball Adderly. My early jazz flute influences were Herbie Mann, Eric Dolphy, James Moody, and Frank West from the Count Basie band. But somehow there was a wall blocking me from doing what they did. I knew I didn't have the skills to improvise, and I believed I didn't have the potential. So thank goodness for the Jamey Aebersold series of jazz instructional LPs and books! I started practicing like crazy whenever I had a free moment, trying to learn the vocabulary of improvisation. It was a gold mine- someone had finally codified the secrets of improvisation. And when you finally made your mark in jazz, it was with Free Flight-not exactly a straight-ahead bebop combo. It was never my intention to have a bebop combo, because I couldn't do it! I'm not interesting enough to play a 45-minute solo. But I love playing with a strong rhythm section pulse and the harmonic interest of a piano. I love the power of a rock-and-roll rhythm section with a screaming flute on top. I love the acoustic simplicity of new age flute-and-piano music. It's very rewarding for me to have a band that lets me pursue all those things. I'm a total Yamaha guy. I have two great Yamaha 900-series gold flutes with sterling silver keys. I also have a YPC-92 wooden piccolo-another great instrument-and Yamaha alto and bass flutes as well. Even my recorders are Yamahas. I've had a wonderful, long-term relationship with Yamaha. I can always, wholeheartedly, recommend any of their products because of the quality control. That's especially true of the student models; they come out of the factory truly ready to play. So one flute model suits all your styles? Yes. It's tremendously flexible. I can use it acoustically, when I play a concerto in front of an orchestra, amplified with a mic for live performances, and in a recording studio with both close micing and distant micing. I like having an instrument that has some variety in any potential situation. [Laughs.] Like myself, I guess!